Description: All-in-one software that creates an interactive Flash music player with just a few mouse clicks. Play your MP3 files on your website, CDROM or as a stand alone application. Comes with multiple professionally designed jukebox skins. No Flash knowledge, coding or design skill is required. 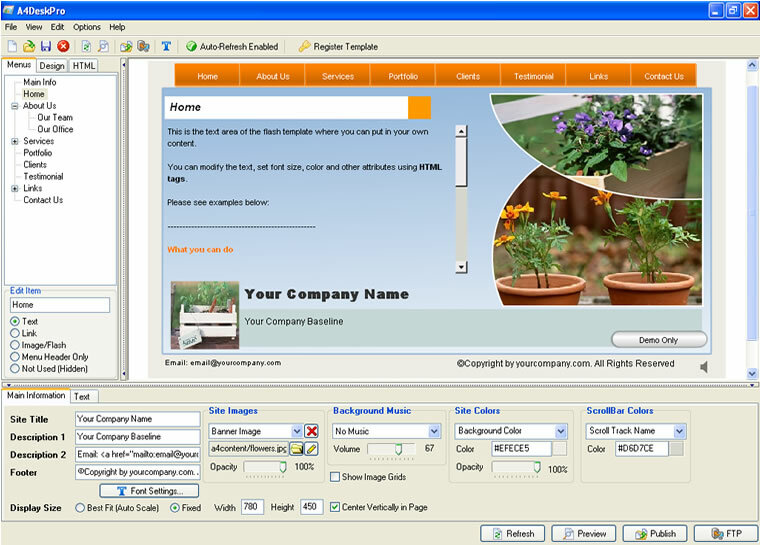 Description: A4Desk Flash Photo Gallery Builder software, creates flash photo album / flash image gallery / foto gallery on your website in minutes, easy to use, user friendly and no coding required. Description: A4DeskPro Flash Website Builder allows you to build your site in just 5 minutes, with professional designed templates! Runs on Windows 98/ME/2000/NT/XP/Vista platforms.